A few weeks ago I discovered designer Rebecca Minkoff (@RebeccaMinkoff on Twitter) had created a handbag line called Minkette exclusively for the Home Shopping Network (HSN). The line includes four bags which are the Enchantment Leather Hobo, the Tenderness Croc-Clutch, the Valentine Studded Leather Hobo, and the Rapture Croco Embossed Leather Tote. 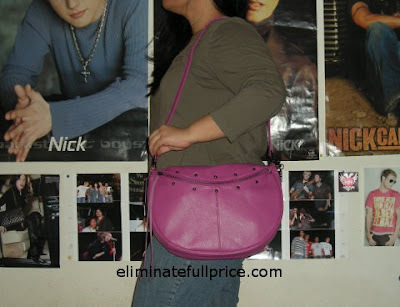 When I looked at all of the bags, I immediately fell in love with the Enchantment Leather Hobo. It looked simple and not at all flashy. The retail price of Enchantment was $350.00 but it was on clearance for $125.00. Even though the price was already lowered I held onto a small morsel of hope that HSN would drop the price again. I monitored the bag everyday to check if the price had changed. My wish came true because last week the price went down to $62.47! 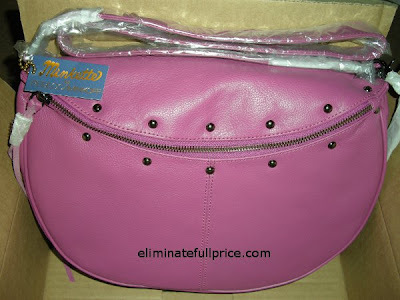 I couldn't resist the price so I took the plunge and ordered the Enchantment in the Fuchsia color. It arrived on Thursday and when I opened the box I was satisfied with what I saw. The Enchantment was bigger than I expected because in the pictures it looked small. I'm happy that it's a great size and that it can hold a lot. What made this purchase even better for me is in November 2009, I had won a $20.00 gift card from Home Shopping Network's Great Gift Giveaway. I went ahead and used the gift card which brought my order total to $55.09! My total savings from this purchase is nearly $300.00! 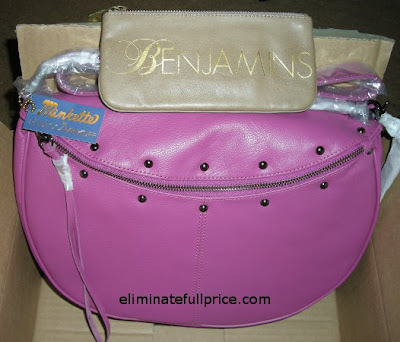 If you remember from my previous post (My Prize from the Rebecca Minkoff Daily Giveaway) I had recently received a Rebecca Minkoff Benjamins wallet from a giveaway I won in November 2009. I thought the Enchantment would go nicely with the Benjamins wallet since they're from the same designer. Here's how the bag looks on me. I just adore the color so much. If you're interested in purchasing the Enchantment, it's currently sold out but the 3 other bags, the Tenderness Croc-Clutch, the Valentine Studded Leather Hobo, and the Rapture Croco Embossed Leather Tote, are still available on clearance at http://www.hsn.com. Just type in "Rebecca Minkoff" in the search box when you go to the HSN website. I absolutely love that bag! The color is beautiful, I have to agree! I have a similar color bag myself. (Except, it's more pinky, like a hot pink, with a gold simmer.) It has to be fixed, though, because the interior has a hole in it. It's a huge square-ish tote. I love it!! Anyway...this sounds like an amazing deal, but I'm not at all surprised to see that YOU of all people found it! By the way, I love the new layout! It works perfectly with this blog! Thanks for the compliment on the bag Mandie! It's definitely a great addition to my small collection of designer bags. It was an amazing deal and it just reminds me that good things come to those who wait. Finding good deals is very addictive but worth it to my bank account. Also thank you for the compliment on the new layout. I thought the previous layout was so boring so I searched for layouts and found this one. The iPod at the top reminds me of my iPod touch which has helped me out so much. Rebecca does design really cute bags and accessories. I love that her designs are unique and unlike others I've seen before. Congrats on your new Benjamins wallet! I'm honored that I could be your inspiration to buy one! It's very functional and cute at the same time. That's awesome you were able to "eliminate full price" on the wallet too :D $15.00 is a great deal! I love it prizes are extremely useful and your ShopBop win is a great example. I just took a look at the ShopBop website and they have so many great items!